This is one of my favorite fall desserts. In addition to bringing a truck full of apples, Jamey's mom brought our Sunday noon meal, including this dessert. Imagine... a graham cracker crust topped with a cream cheese layer topped with pumpkin custard, topped with whipped cream. Somehow it manages to be rich and light all at the same time. And it sings fall. Combine graham cracker crumbs, 1/3 cup sugar and melted butter. Press into a greased 9 x 13 inch pan. Set aside. 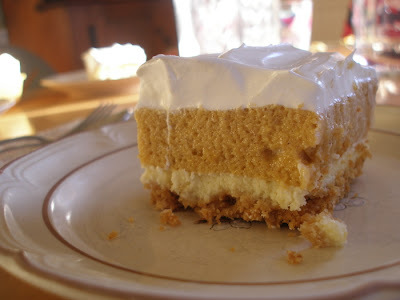 In a mixer, combine 2 beaten eggs, 3/4 cup sugar and cream cheese until well blended and pour over graham cracker crust. Bake at 350 degrees for 20 minutes. In a medium sized sauce pan, combine pumpkin, egg yolks, 1/2 cup sugar, milk, salt and cinnamon. Cook over medium high heat (stirring often) until thick. Remove from heat and add gelatin and cold water. Let the pumpkin mixture cool a bit, then fold in the egg whites and 1/4 cup sugar. Pour this pumpkin mixture over the cream cheese layer and refrigerate to set. Once it's cooled, spread the cool whip evenly over the top and serve or refrigerate until you're ready to do so. It holds up very well if you wish to make it a day or two ahead. This sounds amazing!! Thanks for the wonderful recipe!! I am actually getting ready to try your pumpkin pasta this week! Yea! What a great way to celebrate Fall! This looks amazing. I would love to try it! I have a question though. Do I need to bake the crust & cream cheese w/ eggs portion? I didn't see that in the directions. Just curious. This looks amazing! I'm definitely going to make this!!!! Karen! Yes you do!! Thanks for catching my omission. I corrected it above. Good eye, young lady:-). Ok. I'm sorry, but I have another pumpkin torte question. I think I actually have all my ingredients together & am ready to try it. I was copying the recipe off your post and was wondering if the egg whites & sugar should be beaten before folding into the rest of the pumpkin mixture? I hope I'm not sounding like a pain. I just wanted to be sure. Thanks!